That’s Art and Ann just west of the summit of San Gorgonio Mountain, which can be seen behind them. 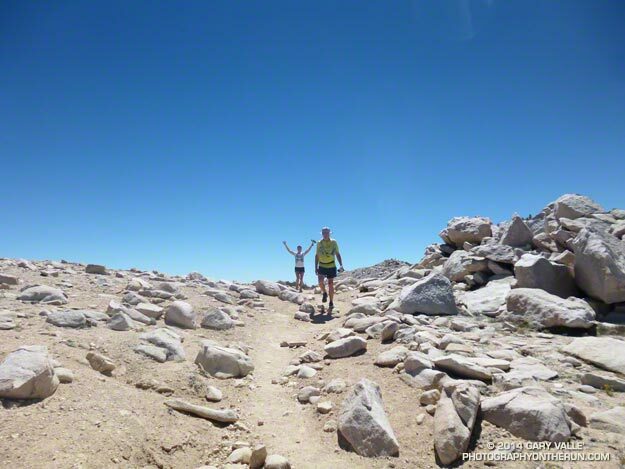 The peak is the highest in Southern California, with a summit elevation of about 11,500′. The ascent of the peak had gone well. Including a stop a South Fork Meadows to top off our water, and another quick stop to talk to Dan the Ranger, we’d left the car just after 7:00 and made it to the summit about 10:30 am. With the short-sleeves and shorts summer weather and zero chance of thunderstorm, the summit was a busy place. We were doing a variation of the South Fork – Dollar Lake Trail – Dry Lake Trail keyhole loop. The variation was that instead of descending the Dry Lake Trail from Mine Shaft Saddle, we continued over to Fish Creek Saddle and descended a “use trail” past (dry) Lodgepole Spring, rejoining the Dry Lake Trail at the Dry Lake outlet. It seems to me that doing the loop counterclockwise — going up the Dollar Lake Trail — maximizes the runnability of the route as a whole. With spectacular trails and scenery the route is every bit as enjoyable as a run in the Sierra, and is my favorite route up Gorgonio from the South Fork trailhead.